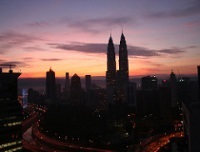 The Petronas Towers were designed to capture Malaysia's emergence as Southeast Asia's cultural and commercial centre. Celebrated as the world's tallest twin towers, they dominate the city skyline. Architects followed the traditional geometric principles of Islamic architecture when designing the buildings, using modern technology to stunning effect. Joined by a skybridge on the 41st floor, the towers are used as office complexes that form part of the Kuala Lumpur City Centre Development Park. They're particularly beautiful when lit up at night. Tours include crossing the famous bridge and going up to an observation deck on the 86nd floor, which offers phenomenal, 360-degree views of the city. Visitors can also enjoy an exhibition detailing the development of the towers, and purchase souvenirs at a gift shop. Opening times: The towers are open to the public Tuesday to Sunday 9am to 9pm (closed from 1pm â€“ 2.30pm on Fridays), but tickets go on sale at 8.30am. Admission: MYR 80 (adults), MYR 33 (children).